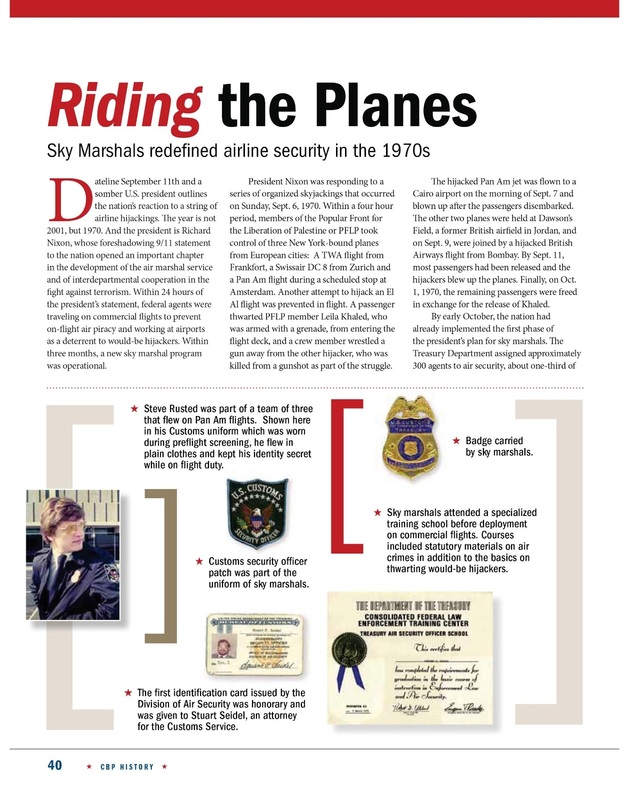 Last year, Frontline, the in-house magazine for the U.S. Customs and Border Protection (Vol 5, Issue 1), ran an article titled "Riding the Planes" describing the Sky Marshal experience it the 1970's. I was interviewed and was one of the Custom Security Officers featured in the story. This year, Clay Biles, until recently a Federal Air Marshal, published The United States Federal Air Marshal Service: A Historical Perspective, 1962-2012: "Fifty Years of Service." Welcome to the next iteration of the Sky Marshal Story. I'll be adding new pages from time to time. I'd appreciate your thoughts. 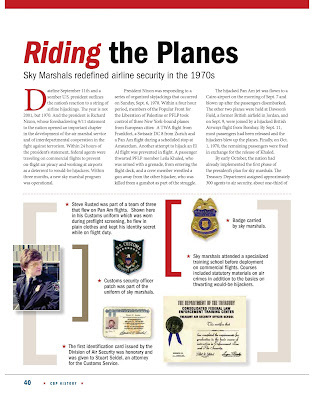 Darrell G Henderson writes that he is still trying to reach out to former Customs Security Officers and Treasury agents who were part of the Nixon-era Sky Marshal program. Darrell has been in recent contact with quite a few CSO's about the reunion dinner he's put together to celebrate the 40th Anniversary of the program. The date for the dinner is September 11th. The dinner will be held in Las Vegas. Darrell has thoughtfully prepared a flyer which you can get by e-mailing him at: cso40annv@cox.net. Darrell has received responses from about 75 former CSO's from around the country, including yours truly, as well as a half dozen former Treasury agents who also participated in the program. He's planned an enjoyable evening. September isn't far off best make some reservations now. I have been promising to send out current information about the planned reunion celebrating the 40th anniversay of the CSO program. I am presenting what I have as of today (July 9, 2009) and I hope all of you will atten the get together. I have reserved a banquet room in Las Vegas, Nevada, for the evening of Saturday, September 11, 2010. The Banquet room is at the BPOE hall in Las Vegas. The reason the evening of Sept. 11, 2010 was chosen is that on Sept 11, 1970, President Nixon announced to the nation his plan to counter the hijacking of American aircraft around the world. After receiving responses from other former CSO's, I will be inviting to the reunion any former Department of Treasury agent who was asked to fly (as a Sky Marshal) prior to the hiring of the CSO's, that trained CSO's either at Ft. Belvoir or downtown DC, or who were members of the Customs Agency that were tasked to be our program supervisors during the four years, more or less, of the program. The anticipated cost of the dinner is $60 per person. It is also anticipated that this will cover the cost of the banquet room, the dinner, decorations in the room and some entertainment. As this may be a once-in-a-lifetime gathering, I would like to suggest that the dress be semi-formal to formal. It is my desire that if there is any contributed money left over, after all the expenses have been met, the extra funds will be donated to charity. When planning your trip to the reunion, please feel free to invite your spouse, boy/girl friend, or significant other. Also, if there is sufficient interest, I would like to see about an informal mixer on Friday, September 10th at a different location. I am thinking about the Marine Corps club in Las Vegas. I will be sending our updated information to the associations of retired agents for Customs, Secret Service, DEA, IRS Internal Security and ATF extending the invitation to the reunion to any of their former agents who participated in the CSO program or acted as Sky Marshals at the beginning of the Nixon program. I will be trying to contact as many organizations as I can think of that might have former CSO's as members. These groups will include Customs, NTEU, NARFE, AARP, Fraternal Order of Police, FLEOA and any other group that comes to mind. If anyone has contacts with any of these organizations, or any other related organization that might have former CSO's as members, please let me know so that I can get the word out. My dream is to sell out the room. As always, please pass this information on to anyone that you are in contact with who would qualify to attend the reunion. Also, does anyone have a new e-mail address for Larry Ryan. The address I have is DHS and I hear that he recently retired. Best regards to all and I am anxious to meet you in Sept. 2010. Hope to hear from you soon saying that you will be there. Apart from my stint as a Federal Sky Marhal over 35 years ago, or Air Marshal as they call in-flight armed guards these days, I have no extensive training or experience in security. Still it seems reasonable, and expedient that the concept of on-board teams of armed and trained personnel might work to protect the commercial ships currently being ravaged by pirates off the Somali coast. So, I tossed that idea out into the vast, uncharted Bloggosphere via this blog about a week ago. If that link doesn't work, the article is dated April 24 and was authored by Tony Capaccio. The generals concurrence means either that I'm a military genius like the general, or that the idea is a pretty obvious solution to the problem. I tend to support the latter conclusion. Either way, the owners and operators of the ships whose cargo and crew are potential victims to the hordes of kat-chewing, teenage Somali bandits should seriously consider the idea. And, no, I'm not offering up my rusty skills for the offer. The last time I was on an ocean -oing vessel was in 1965 when the U.S. Army was transporting me some 3,500 other soldiers to Germany. 7 days bobbing in the choppy waters of the North Atlantic with a ship of nauseated landlubbers scrubbed any desire for sea faring from my soul. Sea Marshals: Sky Marshals at Sea? 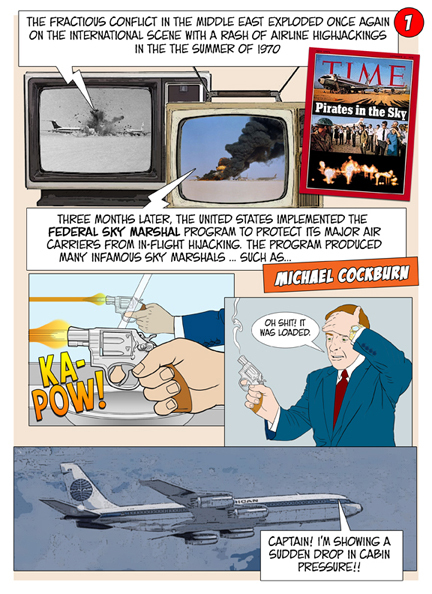 It’s clear to many that the Federal Sky Marshal program was a rousing success because the number of commercial US Air Carriers being hijacked dropped immediately and dramatically after the program was initiated in 1970. Furthermore, when the Sky Marshal Program was folded up in the mid-1970’s the number of airplane hijackings didn’t immediately rise and never returned to pre-program levels. Sadly, as would-be hijackers realized that commercial aircraft were still relatively easy targets, we had periodic incidents over the succeeding years culminating in the tragedy of September 11, 2001. 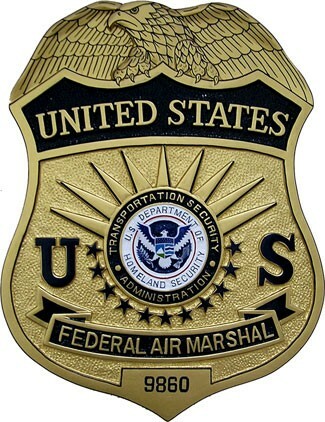 In the 8 following 9-11, we’ve had the Federal Air Marshal program administered by the Department of Homeland Security with undercover Sky Marshals protecting select flights. 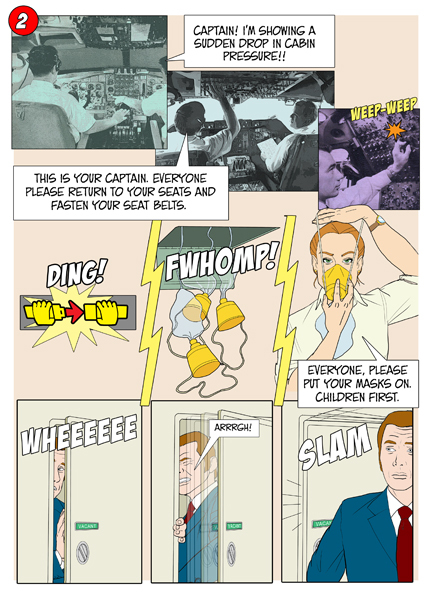 That, coupled with measures such as hardened cockpit doors and the preflight screening of passengers, can be presumed to have been effective in preventing a recurrence of airplane hijackings. Since we know that placing armed security personnel on a commercial transport works to prevent in-flight hijacking I wonder how this technique might be used to combat current threat of seaborne piracy now prevalent along the coast of Somalia. 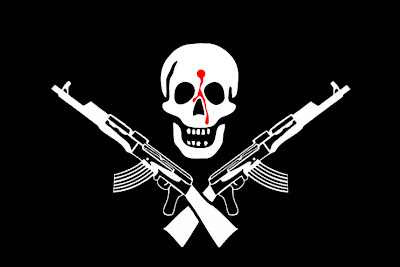 Somali pirates have been raiding international shipping since the early 1990’s. However international posturing, bickering and dithering (e.g., the United Nations) has done little to effectively thwart the increasing attacks on seaborne commerce. To fill the security gap, individual countries including India, France and the United States have positioned ships in the area to provide some protection to the seaborne commercial traffic. Recently, the US Navy killed three pirates and freed an American ships captain. In a similar effort the French Navy interrupted a hijacking and captured some pirates, who they later had to turn loose owing the bizarre local regulations. Despite these efforts the rate of attacks on shipping hasn’t diminished. I’ve read about a proposal to convoy merchant ships through the pirate infested waters, which makes a lot of sense. The naval ships in the area could be concentrated around the convoys, drastically reducing the area they need to protect. Convoys worked against Germany’s U-Boats in World War II, who were far more lethal than today’s kat-chewing Somali riffraff in rubber speedboats. However I’m guessing that ship owners will balk at having to delay their schedules to join up with the next available convoy, preferring instead to gamble that their ship won’t be among the 5% seized. So I propose a Sea Marshal program. It’s really pretty simple. Just before a commercial ship enters the danger zone, it picks up a team of professionally-trained armed guards who have been vetted by some International authority. These guards maintain a round-the-clock vigil until the ship is out of danger, at which time they are retrieved. Placing guards on the ships would be more effective than relying on naval response. Because the naval ships are spread thin in order to cover the vast expanses of ocean, they require hours, if not days, to respond to a hijacking. By definition, onboard guards can respond immediately to any threat. Each team need be little more than a small, well-armed squad – enough personnel that there would always be at least two people on watch. These teams could be self-supporting so as to have little or no impact on the operation of the ship. In principal, they would function something like harbor pilots who are taken on by a ship entering a difficult-to-navigate and / or crowded port. Of course, this would require hundreds, if not thousands of trained personnel, but given the number of men and women operating the naval flotilla that currently patrols the waters – not to mention the cost of operating the naval vessels – it could represent a tremendous savings to the governments whose ships patrol the waters. In the – now – 37 years since I flew as a Federal Sky Marshal, or what they call an Air Marshal these days, I’ve noted with some interest the evolution in airport screening procedures. Since the TSA was created I, along with millions of hapless air travelers, have had to partially disrobe, sort out our toiletries into transparent bags, and have what we presumed were innocuous personal items confiscated all in the name of in-flight security. It’s good to know that our airways are safe from bottles of Evian. I now routinely detach the Swiss Army pen knife from my key chain before a flight lest it disappear into the void that has consumed several of its predecessors. Yes, I admit that I’ve lost a couple of pen knives as the rules for allowing or seizing such items changed without notice over the years. I’m sure seasoned travelers have noted that not just the procedures but the intensity of their enforcement varies greatly from airport to airport. 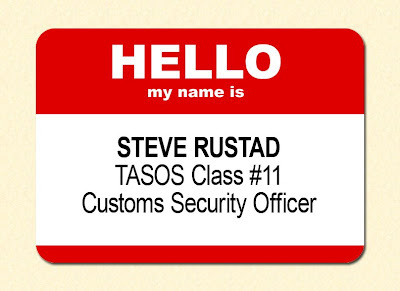 Still, I have compassion for the folks in the TSA because I was part of the cadre of air marshals that initiated the pre-flight bag checks, pat-downs and helped implement the first metal detectors in boarding lounges in the early 1970’s. I know what it’s like to waylay someone who only wants to get through the screening so they can join the queue in the jet way that’s shuffling onto the aircraft. And I had my share of irate passengers complaining about Gestapo tactics. As a result I experienced a mixture of bemusement and concern when my son was confronted by a couple of deputy sheriffs as he and I were departing to visit some potential college campuses some months back. I’m not going to name the airport because I regularly fly out of there. Through I doubt that the deputies featured in my story are among the dozen or so out there who read this blog…you can never tell. So, that morning as we’ve just passed through the metal detector as a young TSA screener halts my son and asks to inspect his backpack from which the screener produces a shiny, chrome-plated shuriken (ninja throwing star) - a souvenir that my son had found at Navy Pier in Chicago some years earlier when our family had visited his aunt. My boy is an avid video game player and his room is a collection of faux martial arts memorabilia. As an aside, my son was in martial arts for more than six years, and though he mastered all of the forms, techniques and disciplines, he also demonstrated a total lack of killer spirit. Or, as his sensei put, “He doesn’t have a mean bone in his body.” Anyway, this particular item of oriental arcana had remained unnoticed and forgotten in his backpack for several years until that fateful day in the preflight screening line. In short order after the TSA had extracted the shuriken from my son’s backpack, two deputy sheriffs assigned to back up the TSA ambled over. I was taken by the irony of the situation when I noticed that the younger of the two cops is a large, angry man who is radiating righteous indignation. On the other hand, my son looks like a deer facing a voracious mountain lion. This cop, who I’ll call officer Cavity Search, launches into a lecture on the seriousness of the circumstances and the implied threat to national security – not to mention God, mother and apple pie – that the infraction represents. In the meantime the TSA guy, who appears bored by the whole thing has us fill out a short form and returns to his duties. 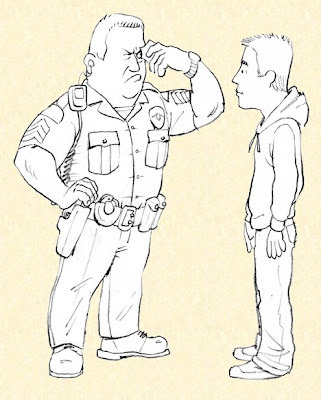 While officer CS is berating my kid, I notice that his partner - a much older policeman with tired eyes – looks as if he is secretly hoping that officer CS runs out of steam before they have to fill out the paper work. As I’m explaining how the shuriken, which was never meant for actual use and therefore falls somewhere between a butter knife and a fingernail file as a weapon, ended up in my son’s backpack, officer Lotta Paperwork reports that shurikens aren’t actually on the list of banned items. Officer CS – much disappointed – winds up with a lecture on responsibility and they let us go. I check in with my son to see what he makes of the whole thing and find that while he’s a bit shaken he appreciates implications…and the ultimate reprieve.